On 12 August from 6 p.m - 11 p.m., come and join us for an incredible feast during our Mother’s Day Set Dinner, a dinner designed to impress! Featuring Filetti di Merluzzo Croccanti serviti con Rucola e Condimento di Limone Sorrentino (crispy cod fillets served with arugula salad topped with Italian dressing) as an appetizer and Lasagna Fatta en Casa Condita con Gamberi Rossi e Broccoli en Salsa di Pesto Genovese (home-made lasagna topped with prawns and broccoli with red sauce) as a main. 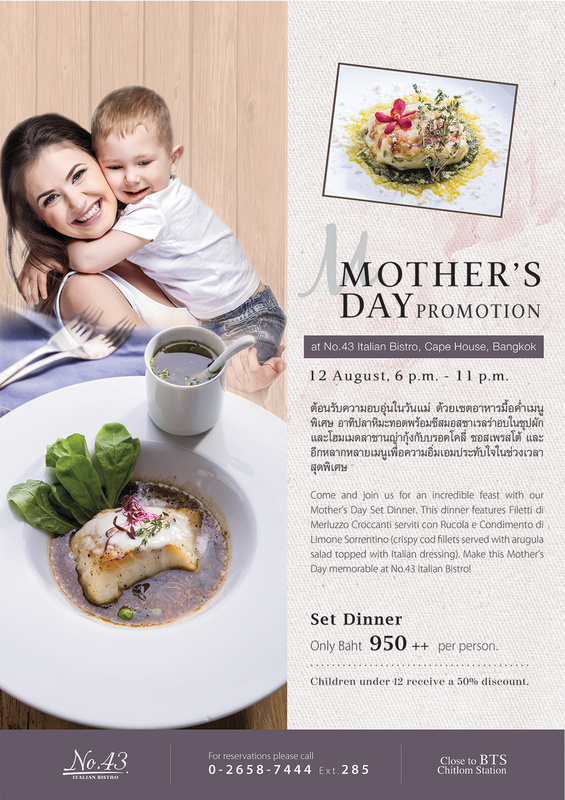 Make this Mother’s day memorable at No.43 Italian Bistro! For more information please contact Cape House Bangkok at tel: 02-658-7444 or visit the website at www.capecollection.com. วันที่ 30 กรกฎาคม 2558 เวลา 16:46 น.